What is the future you can visualise for yourself? What is holding you back from achieving this? Are there times when you do cope with the problem well? What would need to change for you, in order for you to be happier? Hypnotherapy is a powerful combination of Psychotherapy and Hypnosis, which produces enduring results. When you experience hypnotherapy you will learn how the brain works, and how you can change the way your brain works for you. From the first consultation you will understand more about the way you can control your thinking and your behaviour, and how to approach life in a more positive way. You will feel calmer, more relaxed, and then you will easily be able to make those changes! It could be that your idea of Hypnosis involves people losing control of themselves and looking silly, and as far as Hypnotherapy is concerned, this is far from the truth - and as a hypnotherapist I make it a positive, empowering experience for clients, and we soon see the improvements it makes to their lives. Instead of making you do things you don't want to do, I help you to do the things you really do want to do! If you are not sure if Hypnotherapy can work for you, give me a call and we can have a chat. If I am with a client and cannot answer the phone, just leave me a message and I will call you back as soon as I can. I also offer Relaxation sessions of 30 minutes in length, so you can experience deep relaxation for the body and mind in a calm environment away from pressures of work or home. Relaxation is essential for our health, and these sessions will leave you feeling refreshed and calm. My practice at home is near Aldershot, Guildford, Farnborough, Camberley and Alton, and I can work from any distance with clients by Skype or Facetime. I also work at The Surrey and Hampshire Wellbeing Clinic on Tuesday mornings. This is a lovely venue just outside Farnham set in peaceful countryside. You can book in by calling 07714 743060. 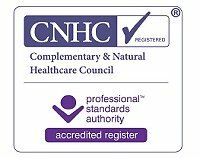 I am registered with the Association for Solution Focused Hypnotherapy (AfSFH)and the Complementary and Natural Healthcare Council (CNHC) and am subject to their professional codes of conduct. You can also find me on the Hypnotherapy Directory. I am insured to practise and hold an enhanced DBS certificate which allows me to work with children and vulnerable adults. I update my skills regularly through continuing professional development and regular supervision. My practice is based in Farnham in Surrey, within easy reach of Farnborough, Aldershot and Guildford.